Double for single occupancy Change Currency What's included? Discovering Europe: all-inclusive Escorted walking tour in Abruzzo - the best of the area on foot. From Rome Fiumicino we drive (2.5 hours) to the medieval village of Santo Stefano di Sessanio (1,250m) in the mountains of Abruzzo’s Gran Sasso & Monti della Laga National Park. We stay in an 'albergo diffuso' – a collection of cottage rooms scattered throughout the village which preserve the original architecture and decor using authentic materials – with modern comforts. We walk up, enjoying panoramic mountain views, to the 10th-13th century castle of Rocca Calascio (1,460m), the highest fortress in the Apennines (4.5 miles, 2.5 hours). We explore the castle and mountaintop village before descending to Calascio. We then visit Bominaco and the tiny Oratorio of San Pellegrino, with its remarkable 13C frescoes, and the adjacent Romanesque Church of Santa Maria Assunta. We then walk up to the 15C ruins of Bominaco Castle and enjoy fine views (2 miles, 1 hour). After visiting the castle, we transfer to the medieval town of Sulmona and our hotel in the historic centre (50 minutes). We visit the Hermitage of Sant’Onofrio, perched on a cliff high on the flanks of Monte Morrone (1 mile, 1 hour). Here in 1294, hermit Pietro da Morrone was told that he had been elected Pope Celestine V. We visit the 4C BC ruins of the Roman temple of Hercules Curinus (Ercole Curino), which dates back to the IV century BC, and lies at the foot of the cliff below the hermitage. Free time in Sulmona, birthplace of Roman poet Ovid, to explore, shop for confetti (Sulmona is famous for its sugared almonds!) and visit the town’s churches and museums (1 mile, 1 hour). Day 5: We drive to the Passo San Leonardo at 1,280m (45 minutes), from where we climb through beech forests and open meadows, with enormous views, to reach the summit of Monte Mileto, at 1,920m. (Packed lunch). We continue across high, upland pastures, before a long and steady descent through beech woods (8 miles, 6 hrs. There will be a less arduous option for those who wish). Transfer to the little spa town of Caramanico Terme at the foot of the Majella mountain massif (30 mins). Our contemporary hotel and wellness centre is situated on the lip of the Orfento Gorge, with heated indoor and outdoor swimming pools, thermal cures and spa facilities. We explore Caramanico Terme, then follow a woodland path climbing past stations of the cross to a viewpoint high above the town. We then skirt fields and meadows on the plateau of San Nicolao before descending back to the lip of the Orfento Gorge and another spectacular viewpoint (4.5 miles, 2.5 hours). Optional afternoon walk, dropping steeply into the bottom of the gorge to follow the crystal-clear river downstream, crossing bridges in the shade of the steep cliff-sides, before climbing back up to the town (1.5 miles, 1 hour). 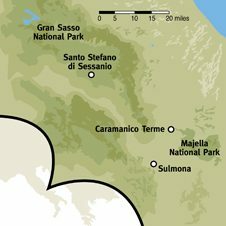 We explore Caramanico Terme, then follow a woodland path climbing steeply past stations of the cross to a viewpoint high above the town. We then skirt fields and meadows on the plateau of San Nicolao before descending back to the lip of the Orfento Gorge and another spectacular viewpoint (4.5 miles, 2.5 hours). Optional afternoon walk, dropping down into the bottom of the gorge to follow the crystal-clear river downstream, crossing bridges in the shade of the steep cliff-sides, before climbing back up towards the town (1.5 miles, 1 hour). Transfer to Rome Fiumicino airport (3 hours). The terrain is mountainous – and the walking moderately strenuous. Good (sometimes rocky) tracks, mule paths, forestry roads and ways across open pastures. Some steep ascents/ descents. Boots with strong ankle support are essential, and walking poles recommended. Delicious game-based pasta dishes, cured meats (venison and boar) and fresh sheep cheeses dominate menus. Locally grown pasta, lentils, and spelt are amongst the best in Italy. Specialities include 'arrosticini' – skewers of succulent lamb, 'pizzelle' (sweet waffles) and confetti – sugared almonds. Local tipples: Cerasuolo (rose) wine, bitter 'genziana' (made from gentian root) and 'rattafia', made from wild cherries. What sort of walking can I expect? What if I don’t want to walk? Where do I meet the group at the start of the trip? What sort of food can I expect? What if I have a dietary restriction or food allergy? What should I bring to wear in the evenings? How much should I budget for items not included? What if I want to extend my trip? Where can I find general FAQs? Have you been on this trip? Tell us your views. 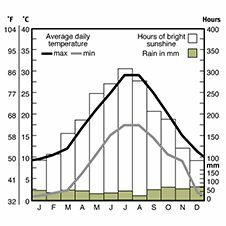 Answer: Meteorological records for the area, taken over a period of more than 10 years, are represented in the Weather Chart provided with each itinerary. Our support vehicles allow you the flexibility to walk 'as much or as little as you like', with drop-offs and pick-ups appropriate to the given day's itinerary. The Tour Leader will tell you each evening about the following day's walking options. This is an 8-day walking holiday, with walks offered on 6 days. The length of each day varies from 3 hours to a maximum of 6 hours walking. ‘Hours of walking’ does not include stops for lunch, sightseeing or rests. The fitness level of this holiday is Grade 3-4. (generally grade 3 with Day 6 at grade 4). The walking/trekking in Abruzzo is moderately challenging but extremely rewarding. The terrain is mountainous: good (sometimes rocky) tracks, mule paths, forestry roads and ways across open pastures. Some steep ascents/ descents. Boots with strong ankle support are essential, and walking poles are recommended. The scenery on this trip is truly outstanding. On certain days our walk takes us into the hills where the paths cross a more rugged terrain – please make sure that your footwear provides sufficient ankle support. Some of our walks are very weather sensitive. If it is not possible to do a walk due to inclement weather, an alternative will be organised. Any such decision is at the discretion of the Tour Leader. The destination airport for this walking holiday is Rome Fiumicino. There will be a set meeting time at Rome Fiumicino airport for the transfer to the first hotel; a set time for the return transfer to the airport at the end of the trip; and a 'recommended flight' to connect with the airport transfers. Booking the recommended flight - which we strongly encourage - guarantees transfers to and from the airport, irrespective of flight schedule changes or delays. For clients not on the 'recommended flight' we cannot guarantee a transfer from the airport should you be delayed for any reason in meeting the group at the specified place and time. In this instance you will have to make your own way to the first hotel, at your own expense. The transfer to the airport at the end of the trip will also be timed according to the recommended flight and we cannot offer transfers at alternative times. Please check with the Reservations Team before making independent arrangements. If you would like a transfer to the first hotel, please ensure that you inform us of this and advise us of your arrival time and flight number as soon as possible. Please also ensure that your flight arrives at the destination airport at least 1 hour before the meeting time, to allow sufficient time to pass through customs and collect your luggage. If you take the recommended flight or are meeting the group at the airport our Tour Leader and Tour Manager will be waiting to meet you for the minibus transfer to the first hotel, which will depart shortly thereafter. They will be wearing green polo shirts bearing the ATG logo. If you arrive late and find that the group has left (there is no sign of them in the arrivals hall or our minibuses with the ATG logo outside the terminal building), please check for a message at the information desk and make your own way to the first hotel, letting the ATG office know you’re on your way. The ATG office number is +44 1865 315 678 or outside office hours please call the emergency number which is +44 1865 315 600. If you are meeting the group at thefirst hotel, our Tour Consultants will contact you upon their arrival. Please indicate your intention during the booking procedure. Bring whatever clothes and footwear you find most comfortable for everyday wear, and a change or two for the evenings – smart/casual. Most of the hotels we use offer a buffet-style breakfast with a wide range of both hot and cold choices. 4- and 5-star hotels almost always offer ‘cooked’ breakfast. Occasionally, in more remote areas, or in some 2 or 3-star hotels, breakfast can be a decidedly more ‘contenental’ affair – e.g bread, croissant, juice, coffee. If a breakfast requires ‘topping up’ to meet the needs of those with a full morning of walking ahead, the Tour Manager will ensure this happens. ATG picnic lunches in Europe are renowned! ‘Happening upon’ an ATG picnic in an idyllic location punctuates each day’s walk. Picnics are colourful, varied and nutritious. Buffet-style, there is a choice of meats, cheeses, salads, breads, fruits - and pudding. Many salads are ‘exclusive’ to ATG and some of these original recipes are in the ATG ‘Table of Moveable Feasts’. to meals in restaurants or private houses. with special dietary needs. At the start of dinner each evening, it is ATG ‘style’ to tell you about the menus and wines for that evening. If there’s anything different that you would prefer, you have only to ask. grown local produce, and accompanied by the best regional wines. At ATG, whose founder/MD ‘travels to eat’ – food matters! accordingly prior to your trip. At the start of the trip the Tour Manager will meet with you to discuss in more detail your requirements. There is no need to dress up for any of the restaurants – smart/casual-wear is fine. On escorted trips everything is included (per the published itinerary) apart from travel to/from the destination airport, items of a personal nature, snacks and drinks outside of the set meals. We are delighted to book extensions for you at either end of your trip. We only book hotels with which we have an established relationship and where we can ensure a high level of service and enjoyment. If you would like an extension booking please indicate this during the booking process and we will contact you with pricing information. The destination airport for this walking holiday is Rome Fiumicino. There will be a set meeting time at Rome Fiumicino airport for the transfer to the first hotel; a set time for the return transfer to the airport at the end of the trip; and a 'recommended flight' to connect with the airport transfers. Booking the recommended flight - which we strongly encourage - guarantees transfers to and from the airport, irrespective of flight schedule changes or delays. For clients not on the 'recommended flight' we cannot guarantee a transfer from the airport should you be delayed for any reason in meeting the group at the specified place and time. In this instance you will have to make your own way to the first hotel, at your own expense. The transfer to the airport at the end of the trip will also be timed according to the recommended flight and we cannot offer transfers at alternative times. Please check with the Reservations Team before making independent arrangements. You are of course welcome to meet the group at the first hotel. Please indicate your intention during the booking procedure. Able to carry on a normal conversation. Slightly out of breath, but able to speak normally. Pausing between phrases to ‘catch your breath’. You never hurry/run to answer the phone. Run, or bound upstairs. Walk quickly/easily upstairs. Walk slowly/steadily upstairs. Take the lift/elevator. Q5 After 15 minutes of fast walking to catch the last train, how long does it take to ‘get your breath back’ and for your heart to stop pounding? Each of our trips is graded according to terrain and length of walking/cycling routes. Your fitness level will give an indication of which grade of walk might suit you.